Behind the back cover of the Desire 500 lies a 1,800mAh battery, which is at least on par with most rivals in the same market space. Android 4.1.2 and the Sense 5 UI on top of it are going to be heavily relied on to ensure the Desire 500 lasts as long as possible. So, let’s get down to the tests. First off is talk time, and the Desire 500 fared okay with a result of 11 hours and 31 minutes. It’s about what you can expect from a battery of this size. Next up is the web browsing battery test. Here, the Desire 500 managed 6 hours and 31 minutes of webpage loading before completely dying. We reckon the Snapdragon 200 is partly to blame for the uninspiring performance as it is under rather heavy load here and draws a lot of juice. Things were looking better when it came to video playback. The Desire 500 managed nearly 8 hours of movie playing (7 hours and 50 minutes to be exact). This puts it around the middle of the table, which is not bad for a device of such humble origins. 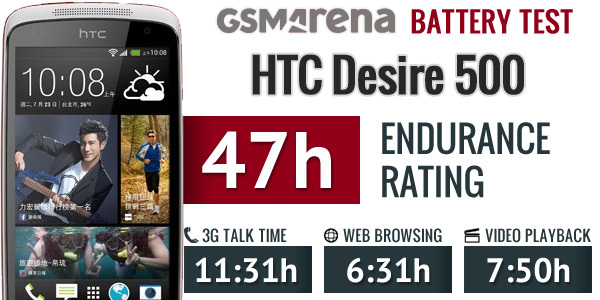 Standby performance on the HTC Desire 500 was very decent and thanks to the okay talk and video playing scores, the mid-ranger managed an endurance rating of 47 hours. This means that you should get just under two days of usage before you have to charge your device if you do an hour each of talking, browsing, and watching videos per day. 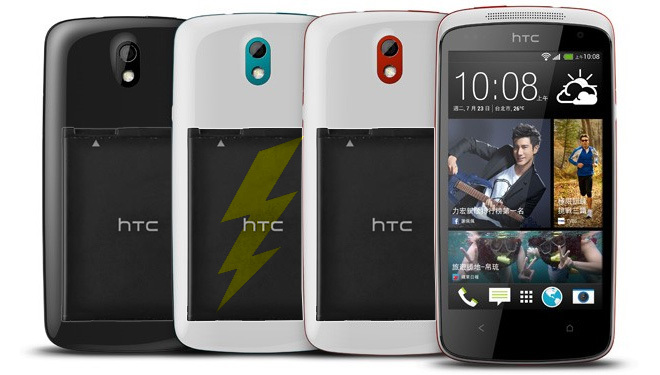 This makes the HTC Desire 500 an excellent choice for those who are not power users and tend to use their phone for more talking than web browsing and video watching.